I recently blogged about deploying kubernetes in Azure. After doing so, I wanted to keep an eye on usage of the instances and pods. Kubernetes recommends Heapster as a cluster aggregator to monitor usage of nodes and pods. Very handy if you are deploying in Google Compute (GCE) as it has a pre-build dashboard to hook it to. Heapster runs on each node, collects statistics of the system and pods which pipes to a storage backend of your choice. A very handy part of Heapster is that export user labels as part of metadata, which I believe can be used to create custom reports on services across nodes. If you are not using GCE or just don’t want to use their dashboard, you can deploy a combo of InfluxDB and Grafana as a DIY solution. While this seems promising the documentation, as usual, is pretty short on details.. In this deployment, all the services, rc and pods are added under the kube-system namespace, so remember to add the –namespace flag to your kubectl commands. Now you should be able to access Grafana on any external ip or dns on the port listed under NodePort. But I was not able to see any data. Login to Grafana as admin (admin:admin by default), select DataSources>influxdb-datasource and test the connection. The connection is set up as http://monitoring-influxdb:8086, this failed for me. Since InfluxDB and Grafana are both in the same pod, you can use localhost to access the service. So change the url to http://localhost:8086, save and test the connection again. This worked for me and a minute later I was getting realtime data from nodes and pods. I run an nginx proxy that terminates https requests for my domain and a created a https://mydomain/monitoring/ end point as part of it. You can do this with any of the Grafana config values, which allows you to reuse the official Grafana docker image straight from the main registry. The code for it in on my LP Junk branches, not really ready for review yet 😉 but happy to have help! You might notice that I am using the keyboard to drive the game in my computer, I have also build a touch joystick that so far works ok in the Nexus 7, but needs some calibration. 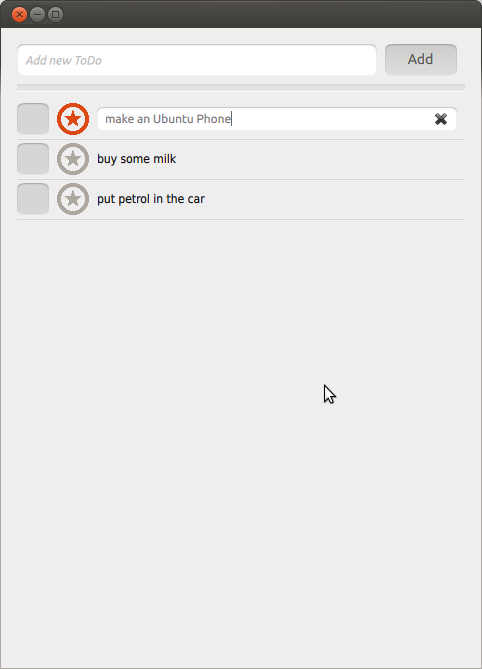 A few months back, I decided to write a Simple ToDo app for Android, then I hooked it up to a cloud backend, using Juju. That was my first Android application, so I got to experience first hand the latest developer documentation and development environment. Last month, Canonical launched Ubuntu for Phones, that gave me the idea to re-write the same application on QML using the Ubuntu Components. Clearly comparing a new SDK-Alpha with a stable platform like Android will seem hardly fair, however, keep reading as you might be surprised of the results. Lets start with QT/QML vs Dalvik/Java – I found QML really easy to get to grips with and be productive. I had the UI (see picture below) running in no time and I would say much faster than with Android. QML is a very flexible declarative environment that allows you to embedded quick logic into the layout. This is a blessing and a curse. While with Android, it was very easy to keep a nice MVC separation, I struggled to stop the leaks in QML. So while it is very easy to quickly write a functional application, it does not impose what you would consider as good development practices. In summary, they are both very powerful development environments. Part of the development experience is the IDE. I must say that I simply love the QTCreator. Possibly not as polish as Eclipse but you don’t need to read a manual to use it. Also, with a quick integration with the HUD, it is just very simple to use. So what is QTCreator missing? A good emulator. The Android Development Kit (ADK) provides a really good user experience to develop mobile solutions. 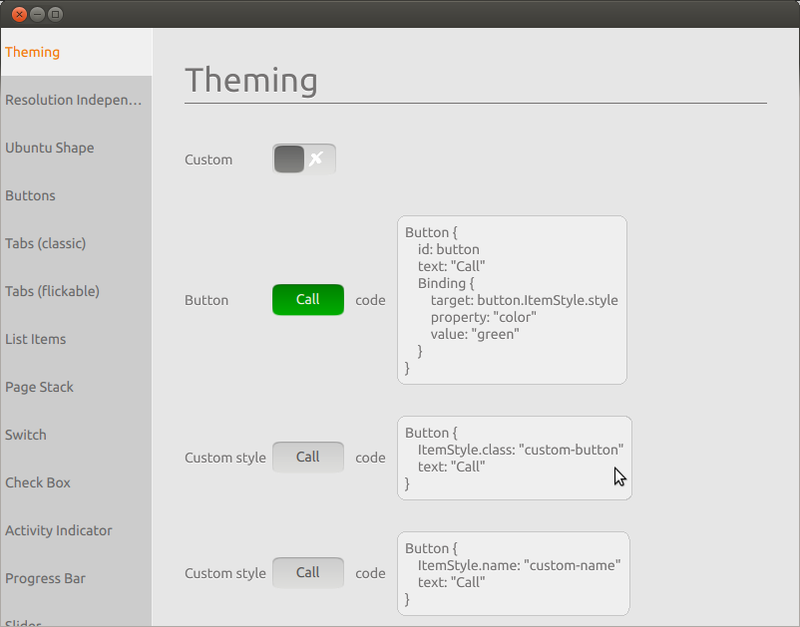 QMLScene gives you similar functionality but does not simulate a phone environment. However, all the technology is there, and I am sure that will be included in the v1.0 version of the SDK. I can’t fault Android developer documentation, but taking into account its popularity, you wouldn’t expect anything else. I was very surprise of the quality of information on http://developer.ubuntu.com/ and specially with the component showcase. The only thing to watch out for is that in Android you can get all the info you need from a single website. With QML you quickly end up pinging between Digia, Nokia and Ubuntu pages. The code is on my launchpad repos. The actual source functionality is not finished as I am still trying to figure out how to add menu options to access Done items. Anyway, the whole thing is pretty compact compare to the Dalvik code. The actual logic is almost identical in both. A ListView that is populate from an List model. All the data is persisted in SQLite db. Both environments have been equally painless to work with, the difference is that the Ubuntu environment has *just* been released as an Alpha. I think this is the start of a very vibrant App development ecosystem. I had a CR-48 Chromebook for a while, which has recently fallen in disuse. While I have never being totally convinced about Chrome OS being a polished, well designed, interface that simplifies the “always connected” user journey that Google was envisioning, I liked the concept. 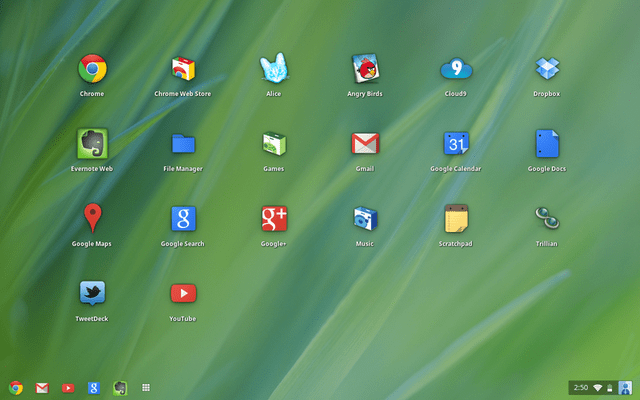 Now I am reading in ArsTechnica that Chrome OS is getting a brand new look, that is … basically.. well, not new. While I am sure there are many technical advantages of a fully hardware accelerated windows managers, my issue is with the [lack of] concept. Having installed Ubuntu 10.4 on my Vostro 3300, I hooked it up on my home made docking station… a belkin usb hub with wireless keyboard and mouse and a 20″ external monitor. Since we started the BugSquad, we had many people come and go from the mailing list, some of them show to the IRC sessions… however most of the ones that do contribute at least once (raising or fixing bugs) always seem to stick around. Getting started guides – It is crucial to have detailed step-by-step guides for newbies, if you are trying to attract people from outside that might not have an in-depth knowledge of the project. For example, we realised that we didn’t have a simple guide on how to raise a bug. We had tones of detailed information on obscure Bugzilla functionality but nothing on the basics! If you have been following the Symbian world, the latest hot news is the announcement of the first Symbian^3 phone by Nokia (the N8). However, between Symbian^1 and Symbian^3 there is missing number – so what is it going on with Symbian^2? While Symbian^2 is not a revolutionary step in platform functionality, it is in terms of Open Source working practices. Despite the fact that Symbian^2 remains SFL, and hence its source still open only to members, there are currently 24 contributions from non-Package Owner companies that have been accepted into the MCL, and another 50 still going through the review process. So why is this important? Firstly, because it clearly signals the willingness of Symbian members to make source contributions and to improve the overall quality of the platform. Secondly, because Symbian^2 is a foundation release and most of these quality improvements are still relevant for Symbian^3. Kudos goes to DOCOMO as the main contributor and to all the package owners that are providing feedback and managing these contributions. To all of you: Thanks and Keep up the good work!